The jaguarundi is a small weasel-like wildcat with short, rounded ears. Adults can reach up to 30 inches in length and can grow a tail length of up to 20 inches. Its fur color varies according to subspecies and can appear brown to dark brown or gray in color. Jaguarundis are also called otter cats because of their short legs, slender elongated bodies, and small flattened heads, giving them an otter-like appearance. Jaguarundis have spots when born, but they eventually disappear as they grow to be adults. 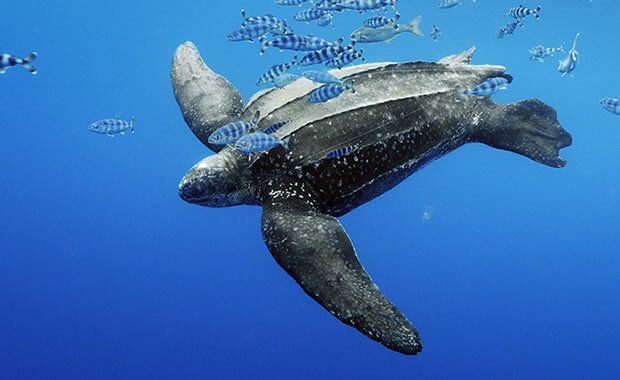 They prefer lowland brush areas close to water or dense tropical areas as their habitat. They are good tree climbers but spend most of the time on the ground. They are also good swimmers. Jaguarundis eat fish that they catch from streams and rivers, small mammals (such as rodents, armadillos and rabbits), and also reptiles, and birds. They are thought to be solitary except during breeding season in the wild but have been known to form groups in captivity. Mating occurs from September to November, and fighting and screaming can be heard while mating. Females give birth to one to four kittens after a gestation period of 70 days. The kittens remain dependent on the mother for about two years. Four of the eight subspecies of jaguarundi appear on the federal list of endangered species: The Panamanian Jaguarundi (Herpailurus yagouaroundi panamensis) is found in Panama, Nicaragua, and Costa Rica, the Guatemalan Jaguarundi (Herpailurus yagouaroundi fossata) is found in Mexico and Nicaragua, the Gulf Coast Jaguarundi (Herpailurus yagouaroundi cacomitli) is found in the US (Texas) and Mexico, and the Sinaloan Jaguarundi (Herpailurus yagouaroundi tolteca) is found in the US (Arizona) and Mexico. Population numbers for the jaguarundi are not known, but the species is quite rare and threatened mainly by habitat loss and hunting for its fur. The jaguarundi is easily tamed and does well in captivity, and some jaguarundis can be found in zoos. Copyright Notice: This article is licensed under the GNU Free Documentation License. It uses material from the Wikipedia article "Jaguarundi". Glenn, C. R. 2006. 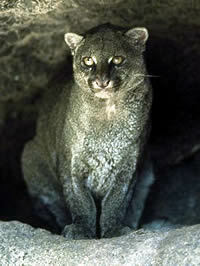 "Earth's Endangered Creatures - Jaguarundi Facts" (Online). Accessed 4/19/2019 at http://earthsendangered.com/profile.asp?sp=217&ID=5.